As I wrote in the last article, I think that this is quite a different aesthetic from the Burkean sublime. There is no threat or horror, no awe. Neither is there conventional beauty, but our eternal fascination with seeing the world at our feet, in miniature, and in great depth and breadth. For those with religious beliefs, it evokes joy and wonder at creation; for those who prefer nature, it shows how small and insignificant man really is on the face of the planet; for the hardened city-dweller it reveals a world not seen from the level of the street. Since the end of the eighteenth century, we have termed these broad and deep views panoramas, which we will see is a word coined specifically for them. But they originated in the early days of landscape painting, before it was polite to paint just the landscape. 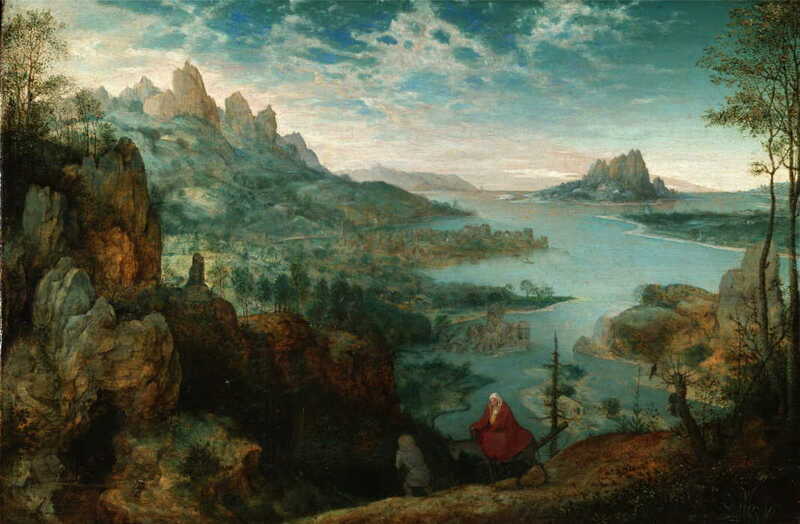 From the pioneering landscape paintings of Joachim Patinir (c 1480-1524), artists realised the power of the ‘big’ view. 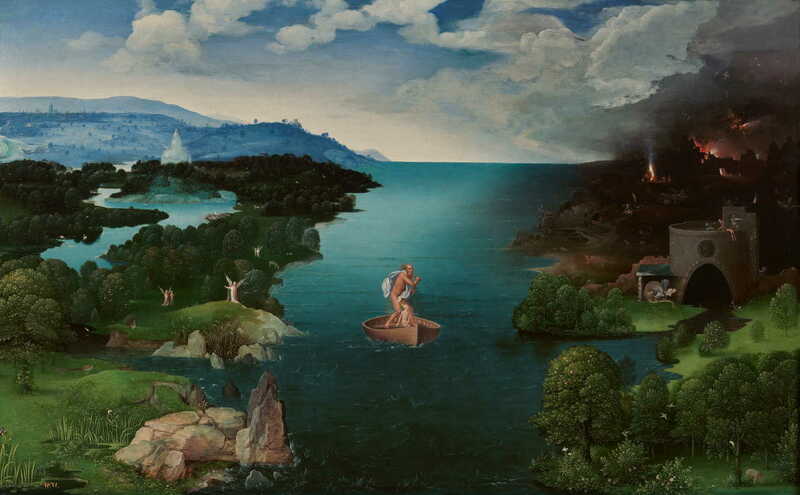 Although Crossing the River Styx (1520-4) shows a mythological scene, which includes fire and damnation in Hell, shown on the right, it was an early form of World View: the spectator is elevated above the surface and looks on and down over a richly-detailed landscape which stretches to the far horizon. Joachim Patinir, Crossing the River Styx (1520-4), oil on panel, 64 x 103 cm, Museo Nacional del Prado, Madrid. Wikimedia Commons. There is some confusion, though. In classical mythology, the River Styx separates the earthly world from that of Hell. Here Patinir appears to show Charon, the boatman, navigating between Hell, on the right, and an Elysian vision, complete with angels, on the left. This may reflect an adjustment of myth to incorporate the Christian dichotomy of heaven and hell, perhaps. Although Patinir paints a crisp and clear horizon to the sea, he uses marked aerial perspective for the land on the left, making it recede into distant haze, to give the feeling of great depth of view, one of the key features both of the World View style and of these panoramic landscapes more generally. 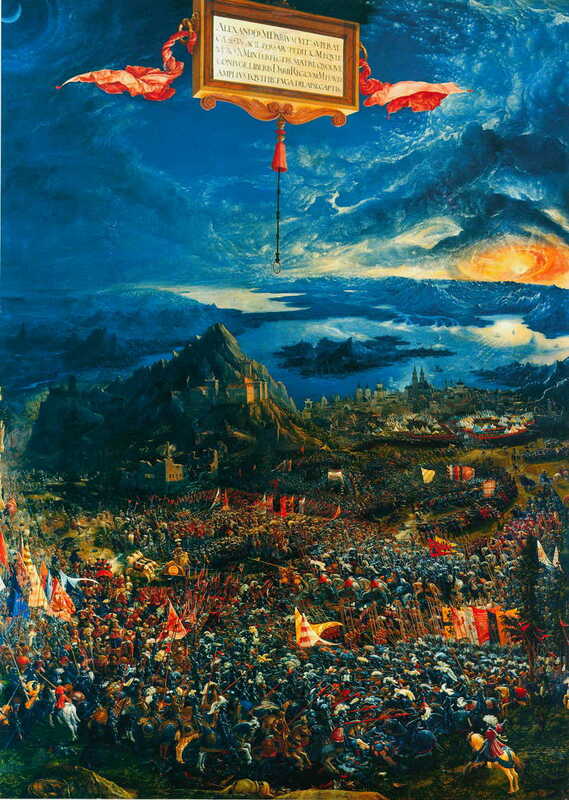 Albrecht Altdorfer (1480-1538) was one of the first artists to adapt the World View style to portray a military scene, in his Battle of Issus (1529). Keeping his canvas in portrait orientation allowed him to show the deep recession in both land and sky. Not only does he paint the soldiers in intricate detail (military precision, perhaps), but the distant town, and he avoids aerial perspective, which would have left the horizon indistinct. Albrecht Altdorfer, Battle of Issus (1529), oil on lime, 158.4 x 120.3 cm, Alte Pinakothek, Munich. Wikimedia Commons. Battle panoramas became a distinct sub-genre which lasted even after those celebrating Napoleon’s victories, and defeats, well into the twentieth century. These include the famous Gettysburg Cyclorama in the USA, and a vast depiction of a Polish uprising in 1794 painted nearly a century later, and located now in Wrocław, Poland. Better known for his populous scenes of more local countryside, Pieter Brueghel the Elder (1526/30-69) employed the World View style in this Landscape with the Flight into Egypt (1563). As with the paintings above, it shows an idealised landscape, into which he has set foreground figures from the Bible story of the departure of Mary, Joseph, and the infant Jesus to Egypt, to avoid the slaughter of infants (the ‘massacre of the innocents’) by King Herod. Pieter Brueghel the Elder, Landscape with the Flight into Egypt (1563), oil on panel, 37.1 x 55.6 cm, The Courtauld Institute of Art, London. Wikimedia Commons. In the absence of knowledge of the actual setting, either by painter or public, it is likely that the body of water shown would have represented the Red Sea, and that the track which the group is following represents the coastal road known as The Way of the Sea. The rocky peaks in the distance, on the right, may have represented Mount Sinai, on the tip of the Sinai Peninsula. If those attributions are correct, then the group is seriously mislocated; however it is most likely that these are intended to be general cues rather than actual places. Peter Paul Rubens (1577-1640) was another prolific artist known better for his work in other more valued genres. Among his limited output of fine landscapes was Summer: Peasants going to Market (c 1618), which also follows the World View style. Rustic interest is provided by peasants with their heavily-laden cart full of produce, and driving cattle and sheep destined for market. Peter Paul Rubens, Summer: Peasants going to Market (c 1618), oil on canvas, 143.4 x 222.9 cm, The Royal Collection, Buckingham Palace, London. Wikimedia Commons. 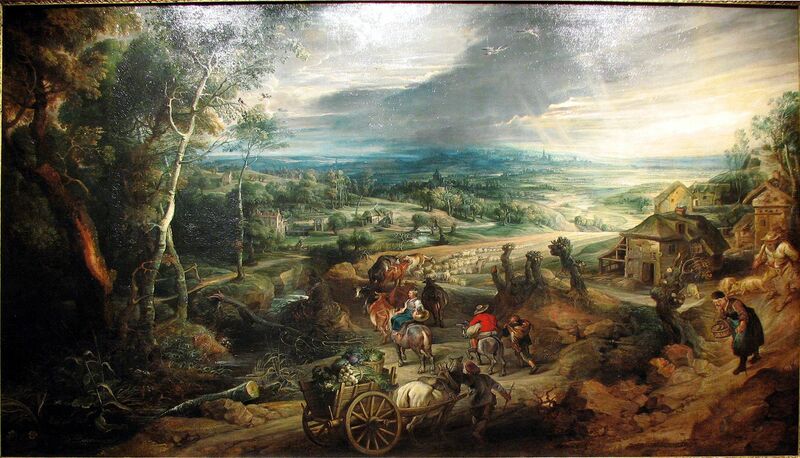 Rubens was an early adopter of a broader format, better suited to panoramic landscapes. This painting has an aspect ratio of 1.75:1 (width:height), which is close to the modern 16:9 HD video standard, whereas Brueghel’s was 1.52:1, similar to that of 35 mm photographic film, and Patinir’s was 1.62:1, the ‘golden ratio’ so popular since the Renaissance. 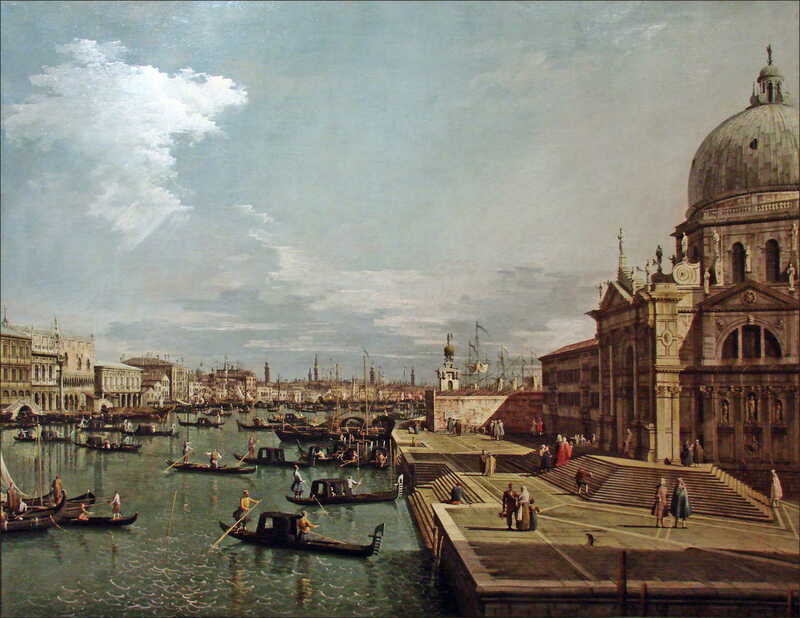 Vedute were the stock-in-trade of Canaletto (Giovanni Antonio Canal) (1697-1768), as exemplified by his The Entrance to the Grand Canal and the Church of Santa Maria della Salute, Venice (1735-40). This view is full of the intricate detail of a cityscape, with more gondolas than seems plausible, and meticulous attention to fine architectural details. However his vedute were typically not as true to reality as might appear: when compared against actual views, he made quite significant alterations in what he depicted. When Canaletto stayed in England in the middle of the eighteenth century, he painted London in veduta style too. This is shown in his Thames and the City of London from Richmond House (1747). 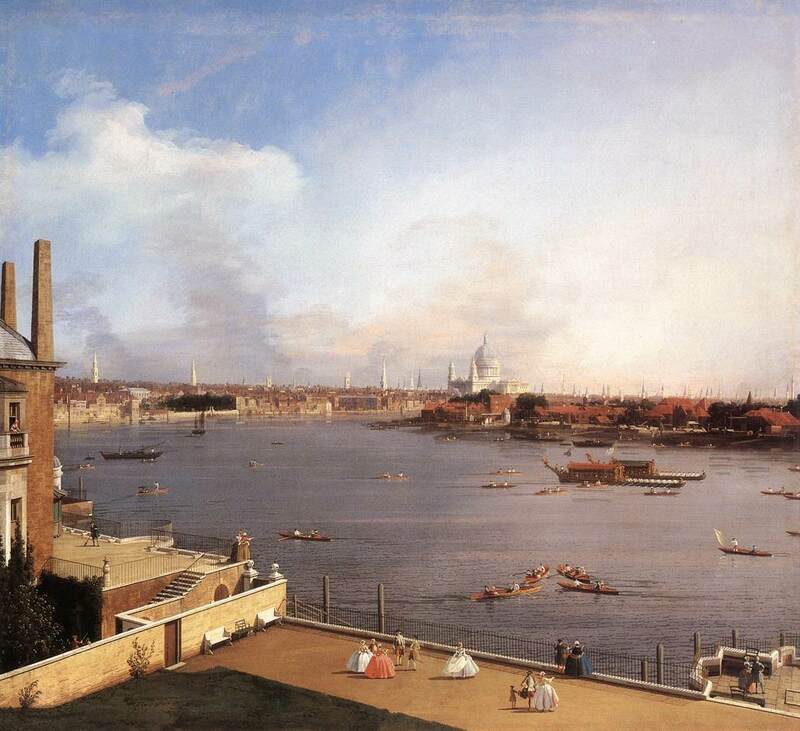 Canaletto (Giovanni Antonio Canal), The Thames and the City of London from Richmond House (1747), oil on canvas, 105 x 117.5 cm, Private collection. Wikimedia Commons. Thus Canaletto popularised another landscape sub-genre, the cityscape, and established Venice as an essential location for all the best landscape painters to visit. Note Canaletto’s avoidance of newer and more radical aspect ratios. These were set for further revision at the end of the eighteenth century, when the panorama finally arrived. Changing aesthetics and tastes drew landscapes ever broader during the eighteenth century. In its final quarter, artists such as Giovanni Battista Lusieri (1755-1821) attained aspect ratios of more than 2.5:1, similar to those used in modern widescreen movies, by assembling multiple supports, in his case sheets of paper, as he worked in watercolour. The panorama itself was pure spectacle and entertainment. The word was coined by Robert Barker for an invention of his which he patented in 1787, the original depicting Edinburgh. This panorama was painted on a large roll of paper, which was first exhibited in Leicester Square, London, an area now known for its leading movie theatres. Baker either stuck the painted roll on the inside of a large cylinder, for rotation about the viewer (also known as a cyclorama), or later he scrolled the roll past the eyes of the viewers. But Lusieri was already painting his extraordinary panoramas on three or four sheets of paper, first of Rome (from before 1780), then Naples and other locations. When depicting views with generally lower relief, he kept the viewer on the ground, therefore followed more in the tradition of the veduta rather than the World View. Curiously most of Lusieri’s works passed into private collections, and were lost to the public eye, until the National Galleries of Scotland exhibited them in 2012. Even now very few are available on web sites. Weston-Lewis A et al. (2012) Expanding Horizons. Giovanni Battista Lusieri and the Panoramic Landscape, National Galleries of Scotland. ISBN 978 1 906270 46 9. Most of John Constable’s (1776-1837) landscapes were broad but hardly panoramic. However in 1816 he painted this unusual view of Wivenhoe Park, Essex, for its owner. It gives the impression of the distortion which might result from a very wide angle lens, but was completed long before such photographic images started to appear. This effect is enhanced by a natural crook in the lake. Once again, in dealing with a motif which was quite shallow vertically, Constable was able to use a view from the ground. The aspect ratio is 1.85:1, considerably greater than in most of his other works (except for more panoramic views of the Thames). Many paintings in JMW Turner’s (1775-1851) huge output, when not revelling in the Burkean sublime, can be considered as breath-taking panoramas. The example that I have chosen here, Petworth Park: Tillington Church in the Distance (c 1828), is viewed from a higher level even though its content has little vertical extent, to emphasise the long cast shadows. 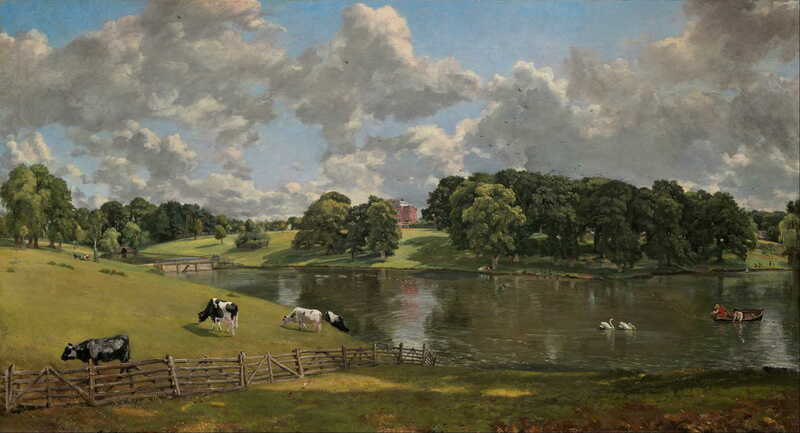 It has a similarly high aspect ratio to the Constable, and the odd arc of the path in the foreground gives a similar wide-angle effect. Painted just a couple of years later, and in more strictly realist style, Théodore Rousseau’s (1812-67) Panoramic View of the Ile-de-France (c 1830) attains the highest aspect ratio yet, of just over 3.7:1, which may have been driven by the growing popularity of panoramas as entertainment. Rousseau is also more conventional in placing the viewer at the level of the rooftops, so as to look over the buildings in the foreground. The angles of lines of trees and other objects in the foreground appear to show wide-angle lens distortion, although the earliest known photograph was not made until 1838. One possible explanation is that Rousseau, and perhaps others before him, used optical devices such as the camera obscura to draw in the view, although I am not aware of any evidence that was the case. Another member of the Barbizon School, Jean-Baptiste-Camille Corot (1796-1875) painted panoramic views plein air and in his studio. This example of Avignon from the West (1836) shows how well he transferred the skills that he learned when in the Roman Campagna to the French countryside. Jean-Baptiste-Camille Corot, Avignon from the West (1836), oil on canvas, 34 x 73.2 cm, The National Gallery, London. WikiArt. 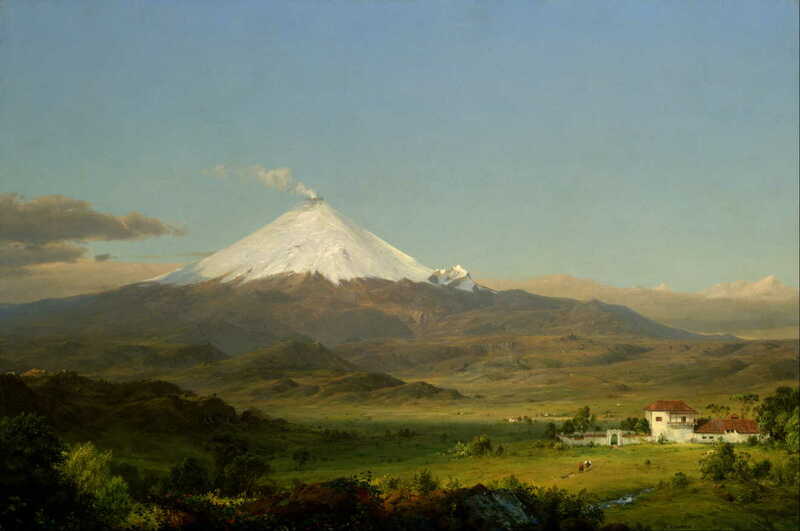 Frederic Edwin Church (1826-1900) painted Cotopaxi (1855), in Ecuador, on many occasions; during his repeated visits to South America he produced detailed plein air sketches, then developed those into finished oil paintings in his New York studio. This particular view is as opposed to the Burkean sublime as he got: a pastoral with foreground ranch, lush greens and rounded foothills, and the volcano itself apparently in peaceful repose. Other versions were not so quiescent: that of 1862, commissioned by James Lenox, shows rugged waterfalls in the foreground, a barren rocky plain, and the volcano itself ejecting a high plume of smoke and ash. All this is lit by a blood-red sun, sitting low in the sky. This was apparently in order for Church’s painting to serve as a pendant to one of Lenox’s other paintings, Turner’s dramatic Staffa, Fingal’s Cave (1832). This emphasises how readily the same subject can be interpreted to inspire awe or wonderment. Church travelled the world in search of its most breath-taking views. 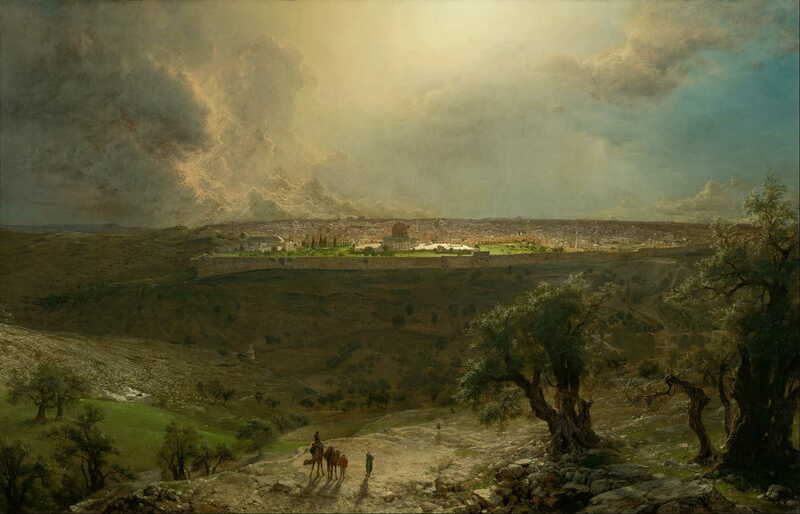 Another fine example is Jerusalem from the Mount of Olives (1870), also assembled from notes and sketches made in front of the motif, and turned into a large finished canvas in the studio. Like many of the panoramas made for entertainment, Church provided a detailed key to the salient features, which was engraved and printed for the edification of the viewer. It was hailed a triumph when first displayed to the public in Goupil’s New York gallery in 1871, and at the end of the century Peter Bergheim made a photo-montage showing the same view. Others of the Hudson River School also created panoramas. Sanford Robinson Gifford (1823-80) boldly attained an aspect ratio of 1.9:1 in his Indian Summer in the White Mountains (1862), with its greater aerial perspective and foreground cattle being reminiscent, perhaps, of Turner’s Petworth. However in this case the view is not contre jour, and the cattle are seen in reflection rather than long shadows. 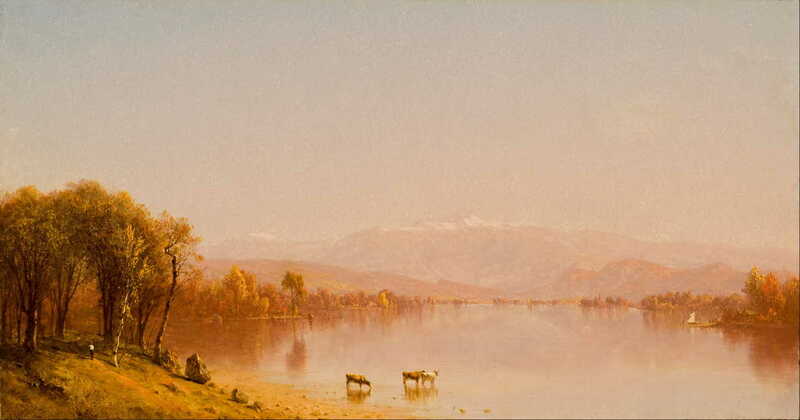 Sanford Robinson Gifford, Indian Summer in the White Mountains (1862), oil on canvas, 40.6 x 76.2 cm, Mint Museum of Art, Charlotte, NC. Wikimedia Commons. O’Toole JH (2005) Different Views in Hudson River School Painting, Columbia UP. ISBN 0 231 13820 2. Isaac Levitan (1860-1900) considered Above Eternal Rest (1893-4) to be his finest painting, and makes interesting comparison to some of the earliest panoramas from the Low Countries in Europe. A convincingly real appearance conceals greater artifice: it is a composite idealised landscape assembled from studies that he made in 1888 of the sixteenth century wooden church of St Peter and St Paul, built on a hill above the town of Plyos on the Volga. The church’s tiny lit window is dwarfed against the expanse of swollen river, and the distant flat wilderness receding deep to a featureless horizon. Above, the dark clouds tower upwards. 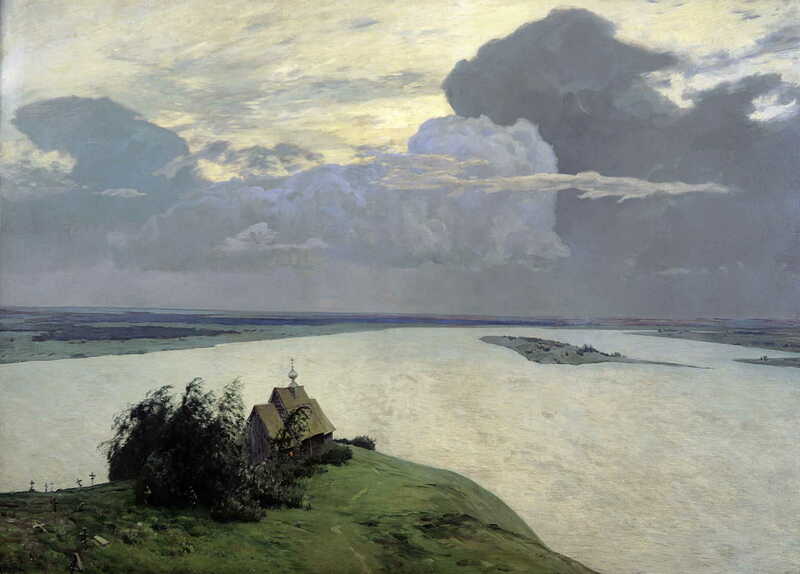 Isaac Levitan, Above Eternal Rest (1893-4), oil on canvas, 150 x 206 cm, Tretyakov Gallery, Moscow. Wikimedia Commons. Levitan’s patron, the collector Tretyakov, was so struck by this work that he bought it immediately. In order to capture the features, Levitan keeps a low aspect ratio, of 1.4:1; in other more panoramic work he reached ratios of over 1.9:1, particularly when depicting flat marshland, as in his Marsh at Evening (1882), where he also adopts a low viewpoint. King A (2011) Isaac Levitan. Lyrical Landscape, 3rd edn., Antique Collectors’ Club. ISBN 978 1 85149 645 7. The final word in painted panoramas must go to Hendrik Willem Mesdag (1831-1915), in his staggering Panorama Mesdag (1880-1). Commissioned as a view of the village of Scheveningen, the Netherlands, from its coastal dunes, it is 14 metres high and 120 metres long, giving it an aspect ratio of 6.8:1. Hendrik Willem Mesdag, Panorama Mesdag (1880-1), media not known, 1400 x 12000 cm, Panorama Mesdag, Den Haag. Wikimedia Commons. But the company exhibiting the panorama as an entertainment went bankrupt in 1886. Mesdag bought it back, and it remains housed in its dedicated building, an appropriately extreme memorial to this long-lasting fascination. By the end of the nineteenth century, public demand for breath-taking panoramas had faded. Furthermore increasing ability of photographers to capture this type of subject made painted panoramas a fad of the past. Since then, and in particular over the last few years, photographic panoramas have held sway, apart from some extraordinary modern hyper-realist works, which are still capable of taking your breath away. Posted in Painting and tagged Altdorfer, aspect ratio, Bril, Brueghel, Burke, Canaletto, Church, Constable, Corot, cyclorama, Gifford, landscape, Levitan, Lusieri, Mesdag, painting, panorama, Patinir, Rousseau, Rubens, sublime, Turner, veduta, vedute, Venice, World View. Bookmark the permalink.